The Game is On … Again! CREATe is delighted to announce the release of the second episode of the award-winning series The Game is On! Drawing inspiration from well-known copyright and public domain work, as well as recent copyright litigation, this series of short films provides a springboard for exploring key principles and ideas underpinning copyright law, creativity, and the limits of lawful appropriation and reuse. Bartolomeo Meletti provides more information on this innovative resource in his blog post. When Sherlock Holmes and John Watson receive a letter from Mary Westmacott, a new adventure at the border between illusion and reality is just about to start. Is Mary only having terrifying nightmares, is she losing her mind, or is she really being haunted by her own literary creations? If there is anyone who can solve the mystery, it is surely Sherlock Holmes. The Game is On! It’s been a successful year for The Game is On! After The Adventure of the Girl with the Light Blue Hair won the AHRC Innovation in Film Award in November 2015 and was shortlisted for a BUFVC Learning on Screen Award in April 2016, this September The Game is On! has been featured in the Ofcom Media Literacy quarterly bulletin. Also, the first episode of the series has recently been used by Into Film to develop the educational resource ‘Exploring copyright for clubs’. 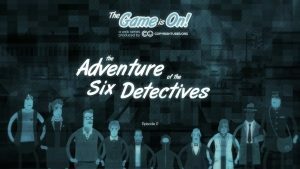 The Adventure of the Six Detectives was made possible by generous contributions from the Authors’ Licensing and Collecting Society, CREATe, and the Arts and Humanities Research Council. The Game is On! is a series of short animated films that put copyright and creativity under the magnifying glass of Sherlock Holmes, providing a unique, research-led and open access resource for school-aged learners and other creative users of copyright. Drawing inspiration from well-known copyright and public domain work, as well as recent copyright litigation, these films provide a springboard for exploring key principles and ideas underpinning copyright law, creativity, and the limits of lawful appropriation and reuse. CopyrightUser.org is an independent online resource intended to make UK copyright law accessible to everyone. The website offers authoritative guidance produced by leading copyright experts as well as videos, illustrations and interactive tools responding to the everyday questions and concerns faced by all copyright users: creators, media professionals, entrepreneurs, cultural heritage practitioners, teachers and students, and members of the public. With over 115,000 unique visitors per year, CopyrightUser.org has become ‘the most visited UK copyright information website’, as recognised by the Authors’ Licensing and Collecting Society.